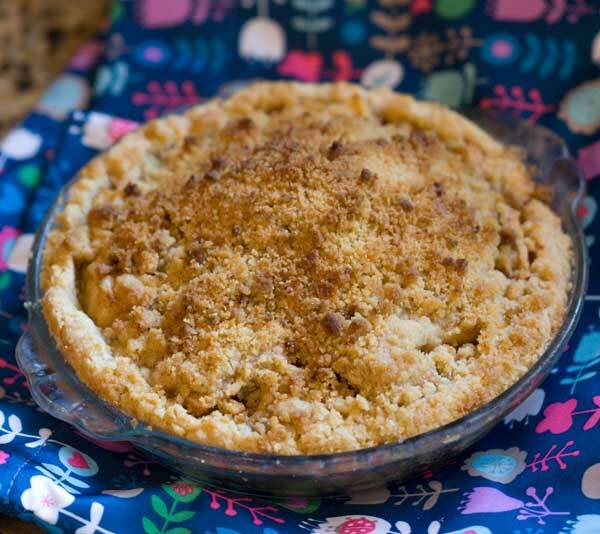 A Dutch style apple pie with a crumb topping and Jonathon apples. Prepare the topping first. Mix the dry ingredients together in a bowl and cut in the butter with a pastry cutter. Keep refrigerated while you make the filling. Peel, core and slice apples. Put them in a large bowl and toss with sugar and cinnamon. Put in the pie dish. Carefully distribute topping across the apples. Bake at 450 degrees (less for pyrex pan) for 10 minutes, then 350 degrees for 40 minutes. Cindy says "Mom made the traditional Crisco crust. I could never get it to roll, plus we like to use less transfats. So I always make an oil pastry crust. For an 8 or 9 inch regular pie plate, stir together 1 1 /3 cups flour and 1/2 tsp salt. Stir in 1/3 cup canola oil. Sprinkle with 2-3 tablespoons cold water, one tablespoon at a time. Shape into a ball and roll between two sheets of waxed paper."